I wrote about our thought process about buying my wife’s next car in an article released slightly over a month ago. To summarize, we decided that we were going to finally break the leasing cycle. My wife and I compromised on the fact that the car had to be newer and have updated bells and whistles. I thought this was a reasonable request given the fact I as asking her to find a car that she was going to own for 10+ years. Our final three contenders were the Toyota Rav-4, Subaru Forester, and the Honda CR-V.
We were being stubborn and waiting for the “great” Memorial Day sales, given the fact that the holiday was surely to bring out the best of each car dealership. Over the last month, I had started leaning towards purchasing new. I thought that if the Memorial Day specials on a new car were close enough to a used car, then it would make more sense to purchase new verses used. Specifically, one of the Toyota dealerships kept telling us about how great their new car deals were going to be AND that they offer 0% financing to all new college graduates. The 0% financing would have been a game-changer if the price to was close enough, and that would provide a large enough swing where the economics could work out towards a new car. Well, Memorial Day arrived and the car dealerships started announcing those “great” specials that we were patiently waiting for over the last month. After shopping every dealership in the neighborhood, the lowest payment offer we received was $450 dollars per month plus tax. Sure, it was 0% financing which I loved, but that was still a lot of capital to be deployed over 60 months. That number came in much higher than I expected, and it left me searching for a new answer to this problem. I also had some slight sticker shock when running through our monthly finances considering a $450 monthly payment. Remember, we just purchased a house, so our monthly expenses were about to shoot through the roof. Was adding a new car, on top of a new house + expenses, really the prudent thing to do? Heck no. After I calmed down from all of this, my wife and I had a pretty serious heart to heart about considering a Certified Used car. The pros were that it would allow us to use the cash to help further improve our new house, vacation, and so on, all while driving a still newer car that has some miles on it. Plus, having a cheaper car would result in less taxes upfront (which would be nice considering our county’s’ sales tax is 8%) and cheaper insurance due to the fact that the value of the car is lower. A lot of pluses were swinging in our favor and the momentum was turning. The used car would have the features she wanted, just an older model with a slightly higher odometer. Our discussion was honest and great, and we left with a decision. Goodbye new car, it was nice knowing you. We were set on purchasing our first used car. The compromise had been made and I began actively scouring the certified used market for a Rav-4. The 2014 Rav-4 presented the best opportunity to get a deal without sacrificing too much. It was the same design as the new model, just without the refreshed electronics. But otherwise, there wasn’t a difference between the two vehicles. For a new car, the post sale price was just under $25,000. 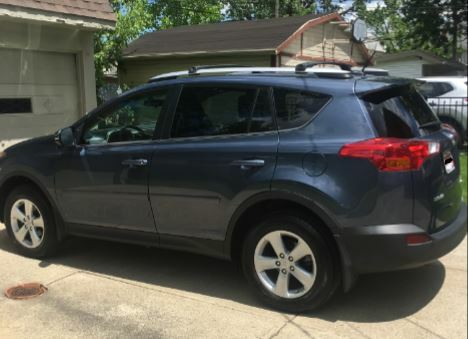 Certified Used 2014 Toyota Rav-4’s were selling in our area for anywhere between $18,250 and $20,000 for a car with greater than 30,000 miles on it. Think about that discount and savings right there. I swear, I think I called every dealership within 150 miles to see what used cars they were offering. Finally, after several hours, I found the one that we wanted to target. Online, there was this 2014 Rav-4 XLE with AWD that was listed at $18,950 with 38k miles on it. The Carfax was clean and it showed that the owner had leased the car and the vehicle serviced every 5,000 miles. There were no major accidents reported and the only blemish on the Carfax was that there was minor “damage” repair. When I talked to the dealership and our insurance agent, they said that this was nothing. Heck, they even dropped statistics/lines such as “1 in every 4 cars have minor damage” and our insurance agent made me laugh by saying “We would be out of business if we concerned ourselves with every piece of minor damage reported on Carfax.” Once we had those discussions, I was very comfortable with the guts of this car. The “fun” part ensued, the negotiation. I knew that the car was already selling at amounts way below the current listing price for comparable based on the research I had done over the last week and CarGurus.com. Their website showed that this was at least $1,500 than others selling in the area. Also, when I discussed a similar car with another dealer, he told me that the online listings weren’t up to date because they had sold that Rav-4 for $18,250, which was their auction price, just because they needed to move the car off their lot. I trusted this dealer because he really had no reason to lie to me about why he just sold a car to a stranger and it wasn’t available for me to buy. Leaving my research, I knew the price that it was listed was great already and there was still some room to negotiate. First, the dealer offered $300 right out of the gate based on an online coupon they were offering. Great! Thanks for the extra money. The dealer presented me with the terms and after all was said in done, the loan would have been for $20,350. I looked at the sheet, and asked them if they could reduce the price another $350, so that the final loan was a flat $20,000. But in my mind, I figured I was saving another 8% of sales tax, so accepting an additional $350 off would result in another $28 in taxes saved. Of course, the dealer wanted to get a deal done, so they accepted my offer. And just like that, the process for purchasing a new car was over. Thank goodness. My crazy month of May was finally slowing down. All in all, the final price of the car we negotiated was $18,300. Could I have asked for more off and had it accepted, sure, but I was very happy with our price and the research I had performed validated the thought in my mind that we were receiving a great deal on a vehicle that could last us another 10+ years if we maintain it properly. We financed the purchase at 1.9% and paid our taxes up front (because I didn’t want to incur interest on taxes, didn’t make much sense to me). When all is said and done, we will be paying $325 per month for the ext 60 months. That is $125/month less than the new vehicle, along with the cheaper tax bill up front and the cheaper monthly insurance payments. All in all, I couldn’t be happier with the purchase and my wife loves her new vehicle! Another chapter in our fast-moving personal finance journey was closed. What are your thoughts about our decision-making and our thought process? Do you typically buy new or used cars? Would you have asked for more off than I did? This entry was posted in Frugal Living and tagged Carfax, cars, debt, Income, Maintenance, money, Rav4, Retirement, toyota, Used Cars. Bookmark the permalink. Nice move. Looks like the research you did paid off. Cars that we buy ourselves have always been second hand cars. So far, so good. Way cheaper than a new one, and less insurance premium on top of that! Thanks Amber Tree – There was definitely a TON of research that went into this decision and quite frankly, I was happy when it is over. I am loving those reduced insurance checks as well. Nice surprise with all of this. Glad you made it through the car buying process. I hate going through it. But, clearly research pays off. Right now, I don’t have a car. I used to be like you and was in the leasing cycle. But, I got out of that last year because of my work, which was overseas. I’m back in the States now and rely on my motorcycle. I rent a car every now and again (which is very expensive), but I go most places with my bike. I’ll be overseas again for another year, so thankfully I won’t have to worry about a car payment or car insurance. However, if I’m back in the U.S., I’m going to be right where you were in deciding if I should buy new or used. I think you made a great choice buying a used vehicle. Out of curiosity, given that your interest rate is only 1.9%, do you think you’re going to try to pay it off early, or are you just going to maintain the minimum payment over the next 60 months? I am thankful it is over. It has to be one of my least favorite processes. I wish I never had to do it again. How nice is it not owning a car? Having a bike would have its perks. Isn’t the cost of owning cheaper for everything outside of insurance? It would be awesome to do that if I lived in a warm weather city. However, a bike in Cleveland in January….no thanks haha I’m very jealous that you have the no car lifestyle though. I would rather pay for a periodic rental that may be more expensive per use than a car you don’t really need and the insurance that goes along with it on a monthly basis. I don’t think I am going to pay this one off early. My main focus is going to be my wife’s outstanding student loans, then my mortgage. By the time those are paid off, I’m sure my auto loan will be long, long gone. It doesn’t fall high enough on the interest rate pecking order at the moment to focus on paying extra. Fair enough. It definitely is much better owning. Having a bike does have it’s perks, but having to put on gear and take it off every time you ride gets old/annoying. When I last rented a car, it felt soooo good being inside a vehicle again. Good luck with your purchase Bert. Even though you are concentrating on your wife’s outstanding student loans and the mortgage, I’m sure you’ll come out on top with the fight against debt. I used to drive manual cars. I know exactly what you are talking about. The worst is when you are stuck in traffic and are constantly starting and stopping! congrats on the purchase of the car! – as always you have done your homework. I don’t know the specifics about the used-car market in the US, but it seems to me that you got a pretty good deal for a car like that. I really like that you remembered things from your journey (“every dollar counts”…etc) to use in the process. I’m not very good at negotiating, i know there’s room to improve. Thanks Dividend Solutions – I’ve tried to continue negotiating as much as possible! I’m not as aggressive as Lanny in person, but I’m slowly starting to get better at it. In the US, depending on the model, the used car market was just as expensive as a new car. I was fortunate that the model I selected hasn’t been refreshed yet and I think that helped drive the cost lower than normal. I love your story. Guess what, all negotiations aren’t going to end in success. But at least you battled and went for it. Sure, you could have stopped at the first no. But you kept trying and kept seeing what advantages you could get. That should work in more situations than not. Thanks for sharing your story as well. Freaking love hearing it! Congrats on the new purchase. I think you did OK with your buy. You clearly did your homework with this buy and just recapping your May was pretty exhausting. To say you have been busy is definitely an understatement. To answer your question, I am totally open to buying a used car if it makes sense. There are periods of time when the used car market is exceptionally hot making their prices very similar to new car buys. That being said, I’m 44 and have made only one new car purchase in my life. Prior to my one and only car buy I used a bike or shared a vehicle with family or roommates. Keep making every single dollar count! By the way, I made my last car purchase in 2009 and used a car broker. I would 100000000000% recommend that route. No hassle, no haggle, the price (with everything included) is quoted and they deliver to wherever you want. You literally don’t have to visit a car lot or deal with salesmen unless you just want to test drive. Thanks. We love the new ride. You know whats funny? I have been hearing more and more commercials for car brokers. Maybe they have always been around and I am just more prone to listening to them now that I have purchased a car haha I’ve never tried one or known somebody that has. Were there any drawbacks? I’m just curious how they assure that you are getting a quality car. Do they run a certified used program similar to other dealerships that provide an additional guarantee? Trust me, nobody is happier that the craziness of May was over. Now, I’m excited to move on and sart the fun process of moving in and making our house our own. Thanks, as always, for the great comment. There were zero drawbacks getting a car from a car broker. I bought new but there are brokers that sell certified vehicles too. It was literally an easy, painless, fast way to get a car delivered to my doorstep. It’s like ordering from a menu. “I want a white Honda Civic, with sunroof, XYZ package, green floor mats, whatever.” Just give your SSN for a credit check to see what interest rate you qualify for, say how much down you want to put from zero to paid in full, choose lease or buy and you get a quote to the penny for what your monthly will be and term. Shop between two or more car brokers and take the cheapest offer though in my case the prices were identical to a few dollars. I think car brokers deal with such high volume that they get good rates from dealerships who just want to move vehicles. If I was looking for another car it’s car broker all the way. Wow – I’m absolutely trying this next time we purchase a car (which for the record, I hope is not anytime son haha). I love the innovation in the industry, because that is a process that was stuck in the dark ages and all the advancements in technology and information. You could do everything you wanted online, dollars and find cars across the country, but you still had to go to that dealership to purchase the vehicle. Thanks again for letting me know about this. Congrats on the new used car,so far i had 3 cars and my 2nd car was certified used car,i am just not comfortable in buying used car,my recent car i think i got a good deal,bought it on the last day of the year 2015. Thanks Desi! I’m with you. I’m not independently comfortable buying a used car and confident that I would be able to identify anything wrong that was getting covered up. That’s why I like the dealer certification program and think it is a nice benefit to purchases. Sure it is a little more expensive, but it is worth it to me. What was you deal??? Pumped to hear about it. The last 3 vehicles I purchased were used cars. Considering the fact that a vehicle depreciates about 20% a year for the first few years, I ONLY buy used. Now I do buy fairly new, still under a factor warranty but possibly 2-3 years old. I’ve said hundreds, even thousands of dollars this way and have had no issues whatsoever. So good for you for taking the plunge and reducing your costs. You won’t regret it! I know I haven’t. What’s going on?? Thank you so much for stopping by and commenting. Reading about the depreciation stat was probably the biggest motivator for me to buy used versus new. It is CRAZY how frontloaded the depreciation is. Sounds like I bought the kind of car that fits your mold, as ours was nearly 3 years old. Hopefully we can have the same kind of luck that you have had! Congrats on your new (to your wife) vehicle purchase. Sorry to hear that you will now have $450 less a month to play with though. Glad to see you put plenty of thought into it. Our family is the same when it comes to BIG purchases (anything above $1,000). Finally getting around to comment congrats on the new car Bert! New house, new car, what’s next?! New dividend stocks I hope! I think you did great on this buy. The only thing I would have done is ask for more off upfront. My dad recently started his early retirement gig which is a used car lot. Dealers always have a lot of room in vehicles, especially used. From what I have seen they make a lot of cash on used cars and like to move them for the cash flow. Also, a car broker is not a bad deal. They are becoming popular around here in the South as well. We are looking for a newer SUV as well now with the little one growing up. I am fortunate enough to go see the auctions and the prices some of the dealers pay. Overall great purchase, I hope life isn’t too crazy and you are enjoying all of the newness in your life! I guess we just completed the trifecta with out last article. Lanny and I just wrote about how we purchased shares in Kroger! I agree with your analysis. I should have asked for more and I was kicking myself when they accepted my offer upfront. I should have started lower to see what else I could have gotten. Someone else introduced me to the idea of a broker and it is a very cool concept. Just eliminate the most painful part of the car buying experience all together. Thanks as well. My wife and I are trying to enjoy the madness as much as possible! Congrats on your purchase! We purchased a used Rav 4 and it served us well for many years before we just recently traded it off. I don’t think you will be disappointed. Thanks Mr. Defined Sight! I’m hoping we can share the successful story you had. Toyotas are built to last, which was one of the best selling points! Great work. That car can last at least 15 years. Best of luck! Glad to read that you guys decided to venture down the used car route, it really can be so tempting to buy a fresh brand new one without any potential problems – you know exactly what you’re getting.. for a premium price of course. If we can get what we want in the used car market then I’m sure we will always want to buy used. For us though we do have limits with buying used – we will only go to big reputable dealerships. Preferably big car brands like Toyota, etc, their reputation is really important to them and having dodgy used car sales is not in their favour. A lot of people will buy used cars privately – massive deals to be had.. but just too risky for us as we are such car novices! We bought our last car in 2014, a 2007 model with 90,000km on the odometer – we are very happy with it! And have only just hit 115,000km after 3 years (we don’t drive much clearly haha). The best and most satisfying part is that we paid in cash – that really felt like an achievement to buy our car outright. I hope your wife loves the car for many many years to come! Thanks Mrs DDU – I agree completely with your limits. Buying a junker can set you back just as far financially as buying a new car. It looks like we share a similar mindset with purchasing used cars. Strong brands known for lasting a long time from a big time dealership. How nice is it that you didn’t have to take out a loan and are debt-less with this purchase?? I’m sure that gave you some strong negotiating power as well.